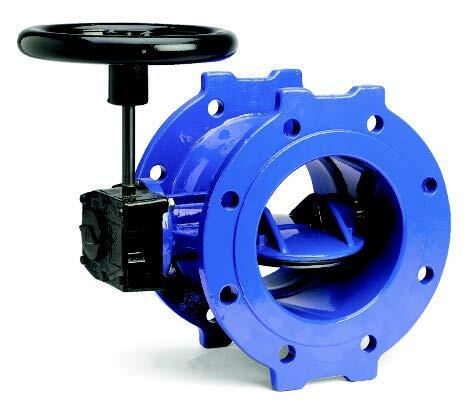 Butterfly valves isolate and regulate flows of water using a disk and actuator; rotating the acutator turns the disc parallel or perpendicular to the flow in the pipeline. The double eccentric butterfly valve conforms to BS EN 593 for regulating or isolating flows in pipelines up to DN2200. Manufactured from ductile iron, valves incorporate a positive retained resilient disc seal and either an integral or replaceable body seat. The valve has three unique attributes: less weight, more strength and lower torque. The integral seat design is for use on water treatment and water distribution lines where buried service is required.